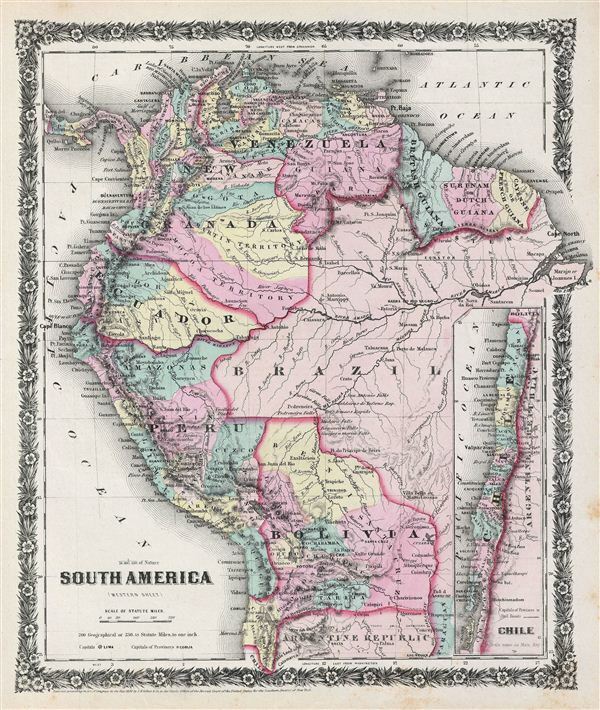 A rare example of Colton's 1858 map of the northwest part of South America. The map covers Venezuela, New Granada, British Guiana, Dutch Guiana, French Guiana, Brazil, ecuador, Peru, Bolivia and part of the Argentine republic. An inset map along the right border depicts Chile. Offers excellent detail both along the coast and inland, especially along navigable rivers. Divided and color coded according to province and country, marks numerous jungle waterfalls, rivers, major railroads, capitals and provinces. elevation rendered by hachure. The Amazon region is unsurprisingly vague though a few river ways and missionary stations are noted. During this time in history, the region was in the midst of political upheaval and civil war. Venezuela was headed for bloody Federal War (1859-1863) in which a significant percentage of the population would perish. Colombia was then under the Confederación Granadina, a short lived federal republic that consisted of modern day Colombia and Panama. The Confederación, facing strong opposition from both liberal and conservative elements, dissolved in 1863 in the midst of the Colombian Civil War (1860 – 1862). This beautiful hand colored map is a copper plate engraving, featuring a delicate floral style border only used by Colton in this particular atlas. Dated and copyrighted to J. H. Colton, 1859, this map is by G. Woolworth Colton and the text is by Richard Swainson Fisher. Published from Colton's 172 William Street Office in New York City an issued as part of the1859 edition of Colton's Illustrated Cabinet Atlas and Descriptive Geography.